This is actually the best thing I have ever seen in my life. Don't you have to be, like, bitten by a radioactive librarian or something? You're already a superhero librarian. I have her in a blue dress on my shelf! I'm hoping it works that way too. AH, my garage feels spotless! 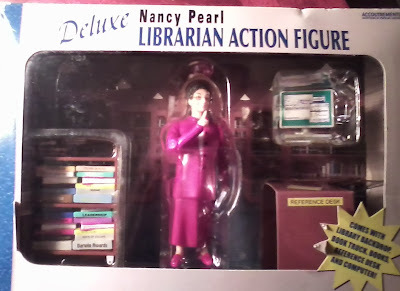 I stumbled upon your site while I'm looking for gift ideas for our retiring librarian. I'm on the library board and am at least 25 years younger than anyone else there, and 1 of 2 females. I'm trying to convince them a watch is not the way to go for a retirement gift - she's an older woman who is going to do some travelling and she loves to knit - her staff has recommended a wool shop gift certificate. I'm trying to convince the old farts - but I think I need something to hand her too, perhaps engraved - any ideas for the right words to thank her for knitting the library community together for the past 25+ years?